How do I use a link to invite users to my Community / Project? Dedicated URL Source allows you to create a customizable URL to distribute to your users in order to join your Community or Project via an Opportunity. Having a unique URL is handy to post on your website, distribute through email, documentation, forums, advertisement, analogue materials, and general hyperlinking convenience. The Key field allows you to customize your invitation URL. The Key must be an alphanumeric value, which means no special characters may be used (however “-” and “_” are allowed). Any spaces that appear in your key will be automatically removed. Open Opportunities makes your Opportunity open to anyone (existing in your portal or not). The Opportunity will appear on your portals RSS Feed. To navigate to this page, enter "/open" at the end of your portal URL (yourcompany.centercode.com/open). *In most cases, this will not be checked. Use the QR Code feature to invite candidates via banners, pamphlets, or other analogue marketing materials with a smartphone. 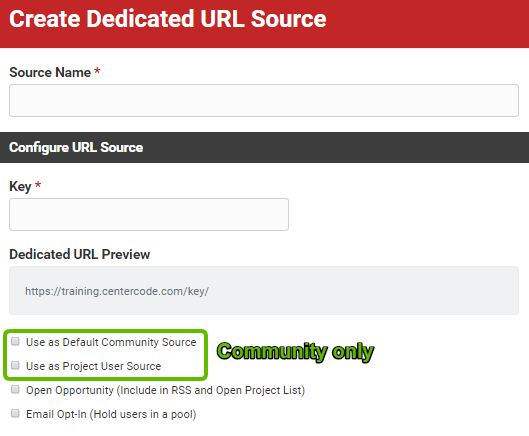 Use as Default Community Source (Community only) allows you to set a single Dedicated URL Source (indicated by a house icon ) as the standard onboarding path for any user who lands on your login page. 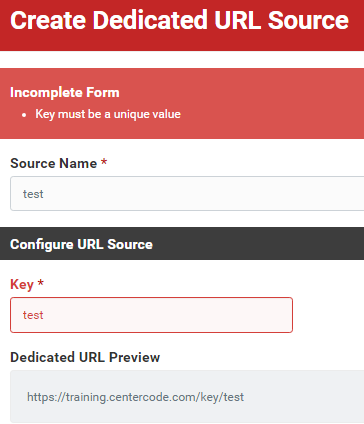 Use as Project User Source (Community only) allows for your Source to be selected at the Project level for new or existing users. It assigns users a specific onboarding path into the Community before joining a Project. Hover-over the tree icon to display where Project Opportunities are being used. Email Opt-In allows candidates to add their email address to a holding pool associated with the Dedicated URL Source. This helps you gauge interest or get an early start building your panel before sending emails. *In most cases, this will not be checked. When a Dedicated URL is deleted, the Key remains unique. If you attempt to re-create a Dedicated URL with a Key that was previously deleted, you'll be unable to do so. When announcing a test to the Betabound Community, we ask that you have an active Opportunity and Dedicated URL. How do Open Opportunities work?